COMMENTARIES AND RESOURCES FOR THE SEVENTH SUNDAY OF EASTER. Father Callan’s Commentary on Acts 19:1-8. Father Boylan’s Introduction to Psalm 68. St Augustine’s Notes on Psalm 68. Fathers Nolan’s and Brown’s Commentary on John 16:29-33. Cornelius a Lapide’s Commentary on John 16:29-33. St Cyril of Alexandria’s Commentary on John 16:29-33. St John Chrysostom’s Homiletic Commentary on John 16:29-33. A modern translation. The homily is actually on verses 16-33. Father Callan’s Commentary on Acts 20:17-27. St Cyril of Alexandria’s Commentary on John 17:1-11a. St Thomas Aquinas’ Catena Aurea on John 17:1-11a. St John Chrysostom’s Exegetical Homily on John 17:1-11a. Word-Sunday Notes on John 17:1-11a. Father Callan’s Commentary on Acts 20:28-38. St Cyril of Alexandria’s Commentary on John 17:11b-19. Fathers Nolan’s and Brown’s Commentary on John 17:11b-19. Father Callan’s Commentary on Acts 22:30, 3:6-11. Father Boylan’s Introduction to Psalm 16. St Augustine’s Notes on Psalm 16. Pope John Paul II’s Commentary/Meditation on Psalm 16. A Patristic/Medieval Commentary on Psalm 16. St Thomas Aquinas’ Lecture on Psalm 16. Fathers Nolan’s and Brown’s Commentary on John 17:20-26. St John Chrysostom’s Homiletic Commentary John 17:20-26. A newer translation of his homily on verses 14-26. Scroll down slightly. St Cyril of Alexandria’s Homiletic Commentary on John 17:20-26. Father Callan’s Commentary on Acts 25:13b-21. St Augustine’s Notes on Psalm 103. A Patristic/Medieval Commentary on Psalm 103. My Notes on John 21:15-19. Fathers Nolan’s and Brown’s Commentary on John 21:15-19. Cornelius a Lapide’s Commentary on John 21:15-19. Aquinas’ Catena Aurea on John 21:15-19. St Cyril of Alexandria’s Commentary on John 21:15-19. St John Chrysostom’s Homiletic Commentary on John 21:15-19. Newer translation of his homily on verses 15-25. Father Callan’s Commentary on Acts 28:16-20, 30-31. St Augustine’s Notes on Psalm 11. Pope John Paul II’s Commentary on Psalm 11. St Thomas Aquinas’ Lecture on Psalm 11. Father’s Nolan’s and Brown’s Commentary on John 21:20-25. Aquinas’ Catena Aurea on John 21:20-25. Commentaries and Resources for the Vigil of Pentecost. COMMENTARIES AND RESOURCES FOR PENTECOST SUNDAY MASS. Next Week’s Commentary and Posts. READINGS AND OFFICE: Please Note: the Lectionary for today allows for an alternate second reading and an alternate Gospel reading. I’ve supplied commentary for all. Today’s Mass Readings (NABRE). Translation used in the USA. Today’s Mass Readings (NJB). Scroll down slightly. The NJB is used in most other English speaking countries. COMMENTARIES ON THE FIRST READING: Acts 2:1-11. Father Callan’s Commentary on Acts 2:1-11. Navvare Bible Commentary on Acts 2:1-11. St John Chrysostom’s Homiletic Commentary on Acts 2:1-11. Homilist’s Catechism on Acts 2:1-11. Bishop MacEvilly’s Commentary on Acts 2:1-11. Father Boylan’s Introduction to Psalm 104. St Augustine’s Notes on Psalm 104: 1, 24, 29-30, 31, 34. Lection Divina Notes on Psalm 104. COMMENTARIES ON THE SECOND READING: 1 Cor 12:3b-7, 12-13. Father Callan’s Commentary on 1 Corinthians 12:3b-7, 12-13. Bishop MacEvilly’s Commentary on 1 Corinthians 12:3-7, 12-13. Cornelius a Lapide’s Commentary on 1 Corinthians 12:3b-7, 12-13. Navarre Bible Commentary on 1 Corinthians 12:3b-7, 12-13. St John Chrysostom’s Homiletic Commentary on 1 Cor 12:3b-7, 12-13. St Thomas Aquinas’ Commentary on 1 Cor 12:3b-7, 12-13. Read all three lectures. English translation in the right column. Homilist’s Catechism on 1 Corinthians 12:3b-7, 12-13. COMMENTARIES ON THE GOSPEL: John 20:19-23. Cornelius a Lapide’s Commentary on John 20:19-23. St Cyril of Alexandria’s Commentary on John 20:19-23. Aquinas’ Catena Aurea on John 20:19-23. Father MacIntyre’s Commentary on John 20:19-23. Navarre Bible Commentary on John 20:19-23. St Thomas Aquinas’ Commentary on John 20:19-23. Scroll down and read lecture 4. Homilist’s Catechism on John 20:19-23. HOMILIES ON THE FIRST READING: Acts 2:1-11. St Thomas Aquinas’ Homily for Pentecost. A gem. Few of his homilies have survived. A Homily on Acts 2:1-11. Pdf document. By Father Johann Evangelist Zollner, a famed preacher of his day. Mass Readings from the NABRE. Used in the USA. Mass Readings from the Jerusalem Bible. Used in most other English speaking countries. COMMENTARIES ON THE FIRST READING: Acts 1:12-14. Father Callan’s Commentary on Acts 1:12-14. Father MacEvily’s Commentary on Acts 1:12-14. Navarre Bible Commentary on Acts 1:12-14. Word-Sunday Notes on Acts 1:12-14. Homilist’s Catechism on Acts 1:12-14. COMMENTARIES ON THE RESPONSORIAL: Psalm 27. Father Boylan’s Introduction to Psalm 27. St Augustine’s Notes on Psalm 27. Patristic/Medieval Commentary on Psalm 27. St Thomas Aquinas’ Commentary on Psalm 27. Pope John Paul II’s Commentary/Meditation on Psalm 27. Word-Sunday Notes on Psalm 27. COMMENTARIES ON THE SECOND READING: 1 Peter 4:13-16. Father MacEvily’s Commentary on 1 Peter 4:13-16. Word-Sunday Notes on 1 Peter 4:13-16. Navarre Bible Commentary on 1 Peter 4:13-16. Homilist’s Catechism on 1 Peter 4:13-16. Pope St Gregory the Great: Admonitions. Includes several appeals to today’s second reading. COMMENTARIES ON THE GOSPEL READING: John 17:1-11a. Navarre Bible Commentary on John 17:1-11a. Homilist’s Catechism on John 17:1-11a. GENERAL RESOURCES: “Archive page” indicates that specific resources to this Sunday’s readings may not be available at the time I posted but will probably become available as Sunday nears. Lector Works. Gives (1) the climax of the reading; (2) the contact point of the reading with our assembly; (3) one special challenge the reading poses for the seasoned lector. At the end of each week’s readings, a brief reflection on the transition from the Table of the Word to the Table of the Eucharist. The Sacred Page Blog: Glory of Love: the Seventh Sunday of Easter. Commentary and reflections on the readings from Catholic biblical scholar Dr. John Bergsma. Doctrinal Homily Outline. Archive page. Gives central idea, doctrinal point, practical application. Liturgical Bible Study Guide. Archive page. Brief notes on the readings followed by PowerPoint presentation. Glancing Thoughts. Brief spiritual reflection. Sunday Bible Reflections. Archive page. Brief audio by Dr. Scott Hahn. Act 17:15 And they that conducted Paul brought him as far as Athens: and receiving a commandment from him to Silas and Timothy, that they should come to him with all speed, they departed. “Athens.” No other city of ancient times was so celebrated for philosophy, learning, and the arts. “Commandment,” a message to Silas and Timothy to come to him to Athens with all possible despatch. Probably he expected a great harvest of souls there. Once in the city of Athens St Paul is soon exasperated by the sight of all the idols (Acts 17:16). Nonetheless, following the order of salvation history (Rom 1:16, 2:9; 1 Cor 1:24), St Paul first went to the synagogue with his message (Acts 17:17), as was his usual custom (Acts 17:1-2). Only after this did he approach others in the public square, including Epicurean and Stoic philosophers. Few of the Pagan Athenians were very well disposed to receive his message even as they take him to the Areopagus to hear him deliver it. Paul takes the opportunity to try and establish a better disposition among them (Acts 17:17-21). Act 17:22 But Paul, standing in the midst of the Areopagus, said: Ye men of Athens, I perceive that in all things you are too superstitious. “In all things,” by all means, “too superstitious,” more religious than men in general; or than the other Greeks. Considering the tact for which St. Paul was always distinguished, the place he spoke on, the polished audience he addressed, with all the other circumstances, it is likely the word is meant in a good sense, to denote more than ordinarily religious in their own way, as they viewed them very attentive to religious observances. It is not likely, he would apply to them any epithet, calculated to alienate their minds or create a prejudice against his teaching. Some, however, are of opinion that the Apostle designedly employs the ambiguous term “superstitious,” tempered by “ὥς,” “as if” found in the Greek, that they were more than ordinarily religious, although their religion was false, directed to false divinities. It is not, however, likely St. Paul would commence his address to the Athenians in any other than a conciliatory spirit—Patrizzi is of a contrary opinion—so as not to create a prejudice against his teaching. Not likely, he would give unnecessary offence. “Seeing.” Closely observing and examining. “Your idols.” Your objects of religious worship. “I found an altar.” This would imply, it was not in any prominent place, but only in some obscure corner. “To the unknown God.” Ancient writers (among them, St. Jerome) tell us there were several altars at Athens, “to the unknown and strange gods.” They seem to think it was one of these St. Paul saw, and in accommodation to his subject uses the singular, unknown God. But the authority of St. Paul makes it almost certain that he saw an altar of which there was no vestige left in the days of those ancient authors, with the inscription in the singular number, as he describes it, especially as he spoke in presence of those who could easily refute him if no such altar with this inscription existed in Athens. He quotes the fact of their having such an altar among them in proof of their being more religious than the others, who had no such altar. Hence, the word “superstitious” is, in some measure, meant in a good sense. They worshipped this unknown God “without knowing it.” Worshipped him for having averted evil, plagues, pestilence, and as the source of the blessings conferred on them, for which they did not give credit to the Gods known to Paganism, Jupiter, Juno, Minerva, &c. Whatever might be said of the principle, their mode of worship was to be reprobated. When worshipping and returning thanks, in their own way, to the source from which they derived benefits, it was implicitly the true God they were worshipping, since He alone is the source of good. St. Chrysostom thinks the Athenians erected an altar to an unknown God, to escape the punishment of not worshipping some god whom they might not have known or heard of. This is the very God, the source of every blessing, whom they were worshipping without knowing it. It was He whom St. Paul was preaching to them, proclaiming His infinite perfections, especially His boundless goodness and beneficence, the fountain of all good. The Apostle adroitly turns to account the goodness of God, the source of every blessing, to preach to them, Him, to whom they were indebted for everything, though hitherto unknown to them. “The unknown God.” The Greek has not the definite article. It is “an unknown god.” “What therefore you worship.” The Greek has ὅ, what, to convey generic and indefinite worship, its mode not particularized. Act 17:24 God, who made the world and all things therein, he being Lord of heaven and earth, dwelleth not in temples made with hands. “Made the world,” &c. The idea of creation was novel to the Greeks. “Dwelleth not,” &c. Whilst temples are erected in His honour, He needs them not to dwell in them; since, to Him belongs the earth and its fulness. He is not confined to them, like the idols of the Pagans with whom He is here implicitly contrasted. This is by no means opposed to the external worship of God, to the erection of temples, the offering of sacrifices in His honour; since there is question here only of the false worship and absurd notions of the Pagans. This is clearly allusive to the worship of idols, served with the hands of men, as if needing food, raiment, help to move from place to place. This the Apostle ridicules here as the excess of folly. It is not so with the true God. Far from depending on creatures for anything; on the contrary, it is on Him every creature depends for whatever is necessary for supporting human life. It is He and He alone that bestows on creatures all the blessings they enjoy, all that is necessary to support life and continue in existence, which He upholds by His conservative Providence. It is we not He that needs structures raised by hands. Act 17:26 And hath made of one, all mankind, to dwell upon the whole face of the earth, determining appointed times and the limits of their habitation. The Athenians derided the idea of the unity of the human origin. They fancied their own origin to be different from that of other peoples. For “all mankind” the Greek has “every nation of men.” In this, the Apostle conveys that all nations, Jew and Gentile, were members of the same family, and should respect each other as children of the same common parent. “Determining appointed times.” The Greek is, before appointed, the meaning is: He allotted to the different nations of the earth several epochs for existence and distributed among them the boundaries of the places wherein they might dwell. The Apostle thus refutes the false notions of the philosophers, especially the Epicureans and Stoics, regarding the free Providence of God and the necessitating action of the Fates. Act 17:27 That they should seek God, if haply they may feel after him or find him, although he be not far from every one of us. God’s object in the exercise of His Adorable Providence, in thus ordering and arranging the human race is “that they should seek God,” and be brought to Him. “If haply, they may feel after Him” by examining and inquiring into His wonderful works and the order established by Him. This is done in an obscure way, just as by the sense of touch—conveyed in the words “feel after him”—allusive to the groping of a blind man—we may discover the existence and qualities of an object. The imperfection of their knowledge is aptly conveyed in the groping of a blind man, relying on the sense of touch. God gives men an opportunity, where-ever located on the face of the earth, of knowing Him from His wonderful works. If they neither find nor worship Him, nor give Him thanks, they are inexcusable. In this, the Apostle may have in view to reprove the stupid idolatry of the Athenians. “Haply” may imply that while they may “find him,” it is doubtful, whether generally speaking, they would do so, owing to their own fault. “Although He is not far,” &c., meaning, He is quite near, as indicated in His creative and Preserving Power. Hence, we can easily find Him by the light of reason, prescinding from the still clearer light of revelation. Act 17:28 For in him we live and move and are: as some also of your own poets said: For we are also his offspring. “For in Him we live,” &c. The particle “in,” as Beelen observes after St. Chrysostom, clearly refers not to mere instrumentality (by), but to locality or place. For, it is given as a reason, why God is so intimately present that we may “feel Him.” “In Him we live.” To Him we owe our coming into existence; to Him we are indebted for every operation intimately connected with existence. “Move.” To Him we owe our continuance in existence. “We are.” Let Him but withdraw His protecting hand conserving us in existence, and we fall into our original nothingness. “In Him” also indicates, though not directly intended to prove it, God’s immensity. Some distinguished commentators—among them St. Chrysostom—illustrate God’s omnipresence in us and our living in Him, by the example of the air which we inhale, and, as it were, touch and sensibly feel in the act of respiration. Without Him we could neither have life nor motion, such as may be seen in inanimated creatures, the clouds, &c., nor continuance in existence. These three pregnant words are neither a climax nor an anti-climax. They only more emphatically convey the same thing—our entire dependence on God, for our coming into existence, for the functions appertaining to existence, for our continuance in existence. The words can also be accommodated to the supernatural state. By sanctifying grace, even more than in our natural state, “we live, move, and are in God.” St. Ambrose says: (de bono mortis) “in Deo movemur, quasi in via. Sumus, quasi in veritate. Vivimus, quasi in vita eterna.” The word “move” in the middle voice, in Greek, is use in an active sense. When addressing the Jews St. Paul quotes their own Inspired Scriptures. Addressing the Gentiles, he quotes an authority highly esteemed by them, their own celebrated Poets. This quotation from Pagan authors occurs in some passages of the New Testament (1 Cor. 15; Titus 1:12). What the Pagans wrote concerning their false Gods, St. Paul applies in a higher and more exalted sense, knowing it to be true, in his own understanding of the words, to the true God and His relations to creatures, who were created and educed out of nothing by Him, and who, in a supernatural sense, became, by sanctifying grace, partakers of the Divine nature (1 Peter 1:4), receiving through it a new spiritual existence, thus becoming new creatures. Act 17:29 Being therefore the offspring of God, we must not suppose the divinity to be like unto gold or silver or stone, the graving of art and device of man. “Being therefore,” &c. Ourselves gifted with life and intelligence, which we received from Him, as the bountiful giver—the great source of life and intelligence as rational creatures, who are by nature far superior to senseless idols, we must know that He is Himself gifted with life and intelligence in a still Infinitely higher order and degree. We cannot suppose Him to be like the senseless dumb idols, made by the hands of man, formed out of earthly materials, devoid of life and understanding, having ears and hear not, eyes and see not. In this St. Paul, with a great amount of tact, identifies himself with them. “We must not,” &c., insinuates the utter folly of worshipping or adoring idols. Act 17:30 And God indeed having winked at the times of this ignorance, now declareth unto men that all should every where do penance. “Having winked at” The Greek means “overlooked,” as if not seeing them: refraining from punishing them; showing patient forbearance. “The times of this ignorance.” Allowing the nations to walk their own ways (14:10). “Ignorance.” Out of prudence, he uses a mild phrase while referring to the great crimes of the Pagans in past times; though to the haughty Athenians, who boasted of enlightenment of all sorts, “ignorance” was a bold, strong term. “Of this ignorance.” In regard to their ideas of dumb idols and their worship of them. “Now declareth.” Commands, enjoins. He will no longer exhibit the same patience. Now, His judgment is near. He enjoins on all men, without exception or distinction of Jew or Gentile, “to do penance,” which is the only means of reparation for grievous sins. Act 17:31 Because he hath appointed a day wherein he will judge the world in equity, by the man whom he hath appointed: giving faith to all, by raising him up from the dead. God’s great mercy and long suffering will not last for ever. He has fixed the term for stern justice in judging mankind, Jew and Gentile. “By the man whom He hath appointed.” Constituted Sovereign Judge of all. Act 17:32 And when they had heard of the resurrection of the dead, some indeed mocked. But others said: We will hear thee again concerning this matter. “Some mocked.” The Epicureans principally. Whatever ideas the Pagans may have had of the duration or immortality of the soul, they all spurned the idea of the resurrection of the body, rejecting it as absurd. “Hear thee again.” A polite way of dismissing him, and of intimating their unwillingness to hear him now or hereafter, as their curiosity seemed to be fully satisfied. St. Paul saw they had no idea of hearing him again. Hence, his stay at Athens was so brief. Act 17:33 So Paul went out from among them. Luke Timothy Johnson suggests that this verse gives a very faint echo of Luke 4:30. Act 17:34 But certain men, adhering to him, did believe: among whom was also Dionysius the Areopagite and a woman named Damaris and others with them. The Areopagite. The designation suggests that Dionysius was a member of the court of Areopagus and, therefore, a man of influence. According to Eusebias he became Athens first bishop. Act 18:1 After these things, departing from Athens, he came to Corinth. Bishop MacEvilly, in the introduction to his Commentary on First Corinthians writes the following concerning that city: CORINTH was a wealthy city, situated on the isthmus that divides the Morea from continental Greece. It was destroyed by Mummius (A.C. 146) by order of the Roman Senate, and a hundred years after restored by Julius Cæsar (A.C. 44). It was constituted by Augustus the capital of Achaia (A. 27). In the time of St. Paul, it more than recovered its former opulence and splendour. Owing to its favourable situation for commerce—having a ready communication with the East and West, by means of its ports on the Ægean and Ionian seas—it became the grand emporium in these parts. It abounded in riches, and their attendant vices, of every description. There were two leading vices, however, for which Corinth was particularly remarkable, viz., pride and impurity; the latter of which is often permitted by a jealous God, as the appropriate punishment of the former. The dissoluteness of the Corinthian women became, accordingly, proverbial throughout the rest of Greece; and the loathsome vice of impurity was, to a certain extent, publicly sanctioned—Venus being one of the tutelary deities of the city. We are informed by Strabo (lib. 9), and by Herodotus (in Clio), that the temple of this goddess at Corinth was wealthy enough to support more than one thousand courtezans devoted to infamy and prostitution. Such was the wretched state, such the deplorable spiritual condition of this city, on the occasion of the Apostle’s first visit (A.D. 52), which is recorded (Acts 18). He remained there eighteen months, and founded a Church composed partly of Jewish, but principally of Gentile converts. Act 16:22 And the people ran together against them: and the magistrates, rending off their clothes, commanded them to be beaten with rods. “Rending off,” violently tearing off, by the hands of lictors, their clothes, as far as the waist, to expose their persons to the lash, “beaten with rods.” St. Paul being a Roman citizen, this was a flagrant violation of the laws of Rome. It was, moreover, a gross violation of natural justice to punish men without hearing them in their own defence. Act 16:23 And when they had laid many stripes upon them, they cast them into prison, charging the gaoler to keep them diligently. “Many stripes,” very likely in number exceeding that allowed by the Jewish law, “forty.” The Romans were not bound by this law. It may be to this St. Paul refers (2 Cor. 11:23). Act 16:24 Who having received such a charge, thrust them into the inner prison and made their feet fast in the stocks. “Stocks,” pieces of wood with holes to confine the feet of the prisoners. Act 16:25 And at midnight, Paul and Silas, praying, praised God. And they that were in prison heard them. Their acute suffering caused by having their feet pressed into stocks, probably without a resting place, for their bodies, covered with gore from the scourging (v. 23) did not prevent them from singing the praises of God. Act 16:26 And suddenly there was a great earthquake, so that the foundations of the prison were shaken. And immediately all the doors were opened and the bands of all were loosed. “Suddenly,” as if in response to their prayers. “Earthquake,” always regarded as indicating the power, the presence and anger of God. “Hands of all were loosed.” This looks like miraculous, as the shaking of the earth while it had naturally the effect of throwing all the doors “open,” would not of itself loose the bonds without further intervention. Act 16:27 And the keeper of the prison, awakening out of his sleep and seeing the doors of the prison open, drawing his sword, would have killed himself, supposing that the prisoners had been fled. “Would have killed himself” to escape by self-destruction the severe punishment in store for the prisoners (c. 12:19, 27:42). Act 16:28 But Paul cried with a loud voice, saying: Do thyself no harm, for we all are here. “All here.” Likely all the prisoners fled from the outer prison into that where St. Paul was confined. Act 16:29 Then calling for a light, he went in: and trembling, fell down at the feet of Paul and Silas. “Light,” in Greek, “lights,” borne by his servants who accompanied him; or, it may have a singular meaning, according to the Greek idiom. “Trembling,” from a feeling that all was supernatural. “Fell down,” in token of great reverence. Act 16:30 And bringing them out, he said: Masters, what must I do, that I may be saved? “Masters,” a term of respect. This man’s conscience was evidently touched. He concluded from all he saw—the Earthquake—his own prevention from self-destruction—possibly, from the testimony of the Pythoness, that these “men were servants of the most high God,” (v. 17). He now, enlightened by God’s grace, asks what was the best means of securing eternal salvation. Act 16:31 But they said: believe in the Lord Jesus: and thou shalt be saved, and thy house. “And thy house,” who after your example, believe and embrace the Christian religion. “Believe in the Lord Jesus Christ.” These words have the same meaning substantially as those addressed by our Lord to His Apostles, “Euntes docete,” &c.
Faith is the foundation of justification; but, not the only ingredient; other dispositions and acts are also indispensably necessary. Act 16:32 And they preached the word of the Lord to him and to all that were in his house. “The Word of God.” They more fully developed the words, “believe in the Lord,” &c., v. 31. Giving them a succinct summary explanation of the chief doctrines of the Christian religion, including the necessity of Baptism (v. 33). “And to all that were in his house,” his entire family and domestics. Some say this occurred in the vestibule of the prison, whither the gaoler brought his entire household to hear the words of salvation; others, in the house of the gaoler. The former opinion derives great probability from the words, v. 34, “brought them into his house,” as if this did not occur before. Act 16:33 And he, taking them the same hour of the night, washed their stripes: and himself was baptized, and all his house immediately. “Same hour,” &c. No doubt, an unreasonable time. The rite of Baptism was administered immediately, all at once. Act 16:34 And when he had brought them into his own house, he laid the table for them: and rejoiced with all his house, believing God. Evidently, the Earthquake terrified the magistrates or Prætors, and made them reflect on the injustice of scourging strangers in order to please the multitude, without hearing their defence. Hence, at the earliest hour, they endeavour to undo their act by having them released, “Sergeants,” lictors, who carried rods or staves, as the Greek conveys. They thrust them into the inner prison and made their feet fast in the stocks (Acts 16:24). .As we saw in yesterday’s first reading Paul, at a place of Jewish prayer in Philippi, met and converted Lydia and accepted her gracious offer of hospitality (Acts 16:11-15). Later, while (apparently) on his way from Lydia’s house to the place of prayer, he is confronted by a slave-girl who is possessed with an oracular demonic spirit by which her masters make a good income; and he heals her, much to the anger of her masters who drag him and Silas before the city magistrates and issue the following charge: “These men disturb our city, being Jews: And preach a fashion which it is not lawful for us to receive nor observe, being Romans.” This happened in the city market-place and thus attracted a large crowd (Acts 16:16-21). It is at this point that today’s first reading commences. 22. And the people ran together against them; and the magistrates rending off their clothes, commanded them to be beaten with rods. The people ran together; i.e., they rose up together against the Apostles, and the magistrates had the Apostles’ clothes torn off by lictors, as was customary before flagellation (Livy, viii. 32; Tacitus, Hist. iv. 2y). Paul could have appealed against this beating that he was a Roman citizen, but he preferred to submit to it out of love for Christ. 23. And when they had laid many stripes upon them, they cast them into prison, charging the gaoler to keep them diligently. Many stripes, the number of which was not determined by Roman law, but left to the decision of the judges or lictors. Among the Jews scourging was restricted to forty stripes. This should be understood as being the maximum number of stripes allowed, not the required number in every case (lesser crimes merited lesser stripes). Among the Jews it was a common practice to limit the stripes to thirty-nine to protect the inflicter of the punishment from transgressing the maximum allowed . 24. Who having received such a charge, thrust them into the inner prison, and made their feet fast in the stocks. In the stocks; i.e., in pieces of wood containing holes, into which the feet of the prisoners were so fastened that escape was impossible. The image at the top of the page show oriental stocks used as late as the early 20th century. 25. And at midnight, Paul and Silas praying, praised God. And they that were in prison, heard them. The actions of the afflicted missionaries calls to mind the three young men in the furnace in Daniel 3:24~And they walked in the midst of the flame, praising God, and blessing the Lord. I also recall the actions of St Maximilian Kolbe in the starvation bunker at Auschwitz. 26. And suddenly there was a great earthquake, so that the foundations of the prison were shaken. And immediately all the doors were opened, and the bands of all were loosed. See the release of the Apostles from prison in Acts 5:17-20; and the rescue of Peter in Acts 12:1-19. The shaking of the earth accompanying prayer and praise of God recalls Psalm 18:7-8. Likewise in the Psalms the shaking of the earth is a sign of God’s rule over all (see Ps 97, especially verses 3-4), and of his kingship (Ps 99:1). 27. And the keeper of the prison, awaking out of his sleep, and seeing the doors of the prison open, drawing his sword, would have killed himself, supposing that the prisoners had been fled. Would have killed himself, in order to avoid the great punishment in store for him for having permitted a prisoner to escape. See on Acts 12:19. 28. But Paul cried with a loud voice, saying : Do thyself no harm, for we all are here. 29. Then calling for a light, he went in, and trembling, fell down at the feet of Paul and Silas. 30. And bringing them out, he said : Masters, what must I do, that I may be saved? Fell down, etc. The soldier was convinced that God had supernaturally intervened in behalf of the Apostles. Perhaps he had also heard of their sanctity, the doctrine they had been preaching, and the miracle they had wrought in the case of the poor possessed girl; hence his question. Trembling. This, along with fear is often a human reaction to divine theophanies (Ex 14:30-31; 20:18-21; Judges 6:22-24). 31. But they said: Believe in the Lord Jesus, and thou shalt be saved, and thy house. Believe in the Lord Jesus. See on Acts 13:39. 32. And they preached the word of the Lord to him and to all that were in his house. They preached the word, etc. ; i.e., they briefly explained to the keeper and his family the doctrines necessary for salvation. It is not clear whether this took place in the prison, or in the keeper’s house; more probably it was in the prison or vestibule of the prison, as would appear from verse 34. 33. And he, taking them the same hour of the night, washed their stripes, and himself was baptized, and all his house immediately. From the circumstances of time and place it seems more probable that the baptism of the keeper and his family was not by immersion. 34. And when he had brought them into his own house, he laid the table for them, and rejoiced with all his house, believing God. Act 16:11 And sailing from Troas, we came with a straight course to Samothracia, and the day following to Neapolis. “Troas.” Northwestern Turkey. It was in this city that St Paul had his famous vision beckoning him to come to Macedonia, thus beginning the evangelization of Europe. “Neapolis,” on the coast bordering on Thrace, some say it was in Thrace. 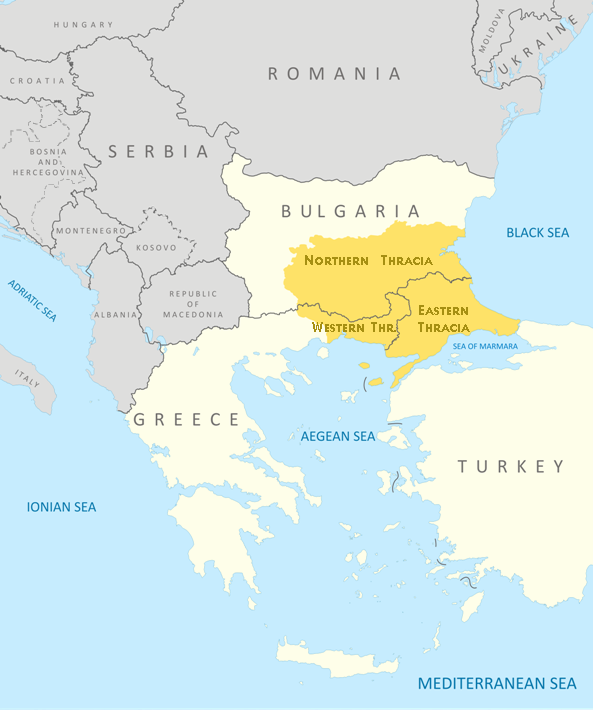 Thrace incorporated parts of modern Bulgaria, Greece, and Turkey. The Apostle made no stay there as he was commanded to go to Macedonia (basically, the upper part of modern Greece). Act 16:12 And from thence to Philippi, which is the chief city of part of Macedonia, a colony. And we were in this city some days conferring together. “Philippi.” It was Philip, Father of Alexander the Great, that enlarged and beautified it. Hence, called after his name. “Chief city,” &c. The Greek would also convey that it was the first or nearest city of Macedonia they came to. It was in one of the four parts into which Paulus Emilius, after having conquered it, divided Macedonia. Philippi was detached by King Philip from Thrace, to which it formerly belonged. Being made a Roman colony, it became the capital in course of time. “A colony” inhabited by Roman citizens with advantages secured by the laws of Rome. Augustus confirmed its privileges of being a Roman colony, first conferred on it by Julius Cæsar. “Some days.” The interval between his arrival and the next Sabbath. That he spent “many days” there is clear from v. 18. No doubt, he remained there for a sufficient period to discharge the duty for which he was sent there by God’s Spirit. Act 16:13 And upon the Sabbath day, we went forth without the gate by a river side, where it seemed that there was prayer: and sitting down, we spoke to the women that were assembled. “Sabbath-day” immediately succeeding Paul’s advent to Philippi. “By a river’s side.” The Jews were dispersed everywhere. No doubt, there were some in this city. They usually built their synagogues or oratories near water, in view of the numerous ablutions practised in their religious worship. “Where it seemed that there was prayer.” The Greek would signify where prayer is usually offered, or “Prayer,” Proseuche, may also denote the place for prayer. The Jews, whenever they could not erect synagogues erected oratories for prayer meetings and other religious rites on the Sabbath. “Spoke to the women,” probably before the congregation had assembled. He mentions the address to the women especially in order to introduce the case of Lydia next verse. Act 16:14 And a certain woman named Lydia, a seller of purple, of the city of Thyatira, one that worshipped God, did hear: whose heart the Lord opened to attend to those things which were said by Paul. “Of the city of Thyatira,” born there, she resided at Philippi. “A seller of purple.” Probably the trade of this woman, a native of Thyatira, where the art of dying purple was cultivated, was very profitable. “Worshipped God.” A Jewish Proselyte “did hear” points to the operation of the human will. “Whose heart the Lord opened,” &c., points to the operation of Divine grace. She, aided by God’s grace, corresponded with the strong impulse of Divine grace, the chief or principal cause in the assent of faith, without which no faith, no embracing the Gospel. Act 16:15 And when she was baptized, and her household, she besought us, saying: If you have judged me to be faithful to the Lord, come into my house and abide there. And she constrained us. “If ye have judged,” &c. Since, whereas, ye have judged me to be “faithful,” &c., she says, “if,” out of a feeling of modest humility. “Constrained us,” by repeated and modest entreaties she prevailed on them to accept her proffered hospitality, which, very likely, they declined at first, as the Apostle did not want to be a burden to anyone (2 Cor. 11:9). COMMENTARIES AND POSTS FOR THE SIXTH SUNDAY OF EASTER. Father Callan’s Commentary on Acts 16:11-15. Bishop MacEvilly’s Commentary on Acts 16:11-15. Father Boylan’s Introduction to Psalm 149. St Augustine’s Notes on Psalm 149. Patristic/Medieval Commentary on Psalm 149. St Albert the Great’s Commentary on Psalm 149. Pope John Paul II’s Commentary on Psalm 149. St John Chrysostom’s Homiletic Commentary on John 15:26-16:4. St Cyril of Alexandria’s Homiletic Commentary on John 15:26-16:4. Fathers Nolan’s and Brown’s Commentary on John 15:26-16:4. Aquinas’ Catena Aurea on John 15:26-16:4. Father Callan’s Commentary on Acts 16:22-34. Bishop Macevilly’s Commentary on Acts 16:22-34. Pope Benedict XVI’s Commentary on Psalm 138. St Augustine’s Notes on Psalm 138. St Albert the Great’s Commentary on Psalm 138. Cornelius a Lapide’s Commentary on John 16:5-11. Actually on 5-17. St Augustine’s Tractate on John 16:5-11. On verses 8-11, actually. Father Callan’s Commentary on Acts 17:15, 22-18:1. Bishop MacEvilly’s Commentary on Acts 17:15, 22-18:1. Father Boylan’s Introduction to Psalm 148. Pending: St Augustine’s Notes on Psalm 148. Pope John Paul II’s Commentary on Psalm 148. St Albert the Great’s Commentary on Psalm 148. Cornelius a Lapide’s Commentary on John 16:12-15. Aquinas’ Catena Aurea on John 16:12-15. St Augustine’s Tractate on John 16:12-15. St Cyril of Alexandria’s Homiletic Commentary on John 16:12-15. Bishop MacEvily’s Commentary on Acts 1:1-11. St John Chrysostom’s Exegetical Homily on Acts 1:1-5. St John Chrysostom’s Exegetical Homily on Acts 1:6. Navarre Bible Commentary on Acts 1:1-11. Father Boylan’s Introduction to Psalm 47. Pope John Paul II’s Commentary on Psalm 47). St Thomas Aquinas’ Lecture on Psalm 47. Father Wilberforce’s Commentary on Ephesians 1:17-23. This commentary actually begins with verse 15. It is a pdf document. Father Bernardin de Piconio’s Commentary on Ephesians 1:17-23. This commentary actully begins with verse 15. Navarre Bible Commentary on Ephesians 1:17-23. Part 1 on Ephesians 4:1-6. Part 2 on Ephesians 4:7-13. On 7-16. Alternate Reading: Father Callan on Ephesians 4:1-13. Alternate Reading: Bernardin de Piconio on Ephesians 4:1-13. Cornelius a Lapide’s Commentary on Matthew 28:16-20. Juan de Maldonado’s Commentary on Matthew 28:16-20. Aquinas’ Catena Aurea on Matthew 28:16-20. Homily by Pope St Gregory the Great. On the text of Mark 16:14-20. Aquinas’ Homily Notes on Acts 1:1-15. Sermon Plan: Some Thoughts on the Ascension. Sermon Plan: Heaven is Our Goal. Christ’s Ascension a Lesson and a Warning to Sinners. Commentary on the First Reading. Why Jesus Christ Went Up To Heaven and What Is The Meaning Of “He Sitteth At The Right Hand Of The Father. The Feast of the Ascension Teaches and Comforts Us. Father Callan’s Commentary on Acts 18:9-18. Navarre Bible Commentary on Acts 18:9-18. Pope John Paul II’s Commentary on Psalm 47. Cornelius a Lapide’s Commentary on John 16:20-23. St Cyril of Alexandria’s Commentary on John 16:20-23. On verses 19-24. Aquinas’ Catena Aurea on John 16:20-23. Includes vs. 19. Navarre Bible Commentary on John 16:20-23. Today’s Mass Readings. Note that there is an alternate first reading. My Notes on Zephaniah 3:14-18. Alt 1st Reading: Bernardin de Piconio’s Commentary on Romans 12:9-16. On 9-21. Alt 1st Reading: Father Callan’s Commentary on Romans 12:9-16. Alt 1st Reading: Navarre Bible Commentary on Romans 12:9-16. Pope John Paul II’s Commentary/Meditation on the Responsorial (Isaiah 12:1-6). Cornelius a Lapide’s Commentary on Luke 1:39-56. Aquinas’ Catena Aurea on Luke 1:39-56. Bishop MacEvily’s Commentary on Luke 1:39-56. Pope Benedict XVI on Mary’s Magnificat. Catholic Encyclopedia on the Feast of the Visitation. Catholic Culture on the Feast of the Visitation. St Bede the Venerable on the Feast of the Visitation. Next Week’s Posts. Includes resources for both Pentecost Sunday and the Vigil. 12, 13 I have yet many things to say unto you, but ye cannot bear them now. Howbeit when He, the Spirit of truth, is come, He shall guide you into all the truth: for He shall not speak from Himself; but what things soever He shall hear, these shall He speak; and He shall declare unto you the things that are to come. He found their sorrow increased by their knowledge of the future, and that they were ill-disposed to bear the coming evils. For sorrow, He says, hath filled your heart. And He thought that it would not be meet to dispirit them by adding the rest, but He buries as it were in timely silence what He had to say next, as likely to cause them no small alarm, and reserves what remained for them to know, for the revelation through the Spirit, and for the light that was to be given them at the fitting season 1. And perhaps also, seeing the disciples slow to apprehend the mystery, because they had not yet been illuminated by the Spirit, nor become partakers of the Divine Nature: For the Holy Spirit was not yet given, because Christ was not yet glorified, as the holy Evangelist says, He speaks thus, wishing to suggest to them that He would hereafter be able to reveal mysteries exceeding deep and passing man’s understanding, while at present He refuses to do this, and with good reason, because He says that they are not yet prepared for it. For when, He says, My Holy Spirit shall transform you and change the elements of your mind into a willingness and an ability to despise the types of the Law, and rather to |449 prefer the beauty of spiritual service, and to honour the reality more than the shadow; then, He says, youwill surely be able readily to understand the things concerning Me. For the complete expression of these things will find place in your hearts when you are well fitted to receive it. One might suppose then that our Lord thought He ought thus to address His disciples. For what He once said as by way of illustration is of a piece with, and will fit in with, the meaning we have just given to His words: No man rendeth a piece from a new garment and putteth it upon an old garment; and again: But neither do men put new wine into old wine-skins; else the skins burst, and the wine is spilled. But new wine must be put into new wine-skins. For the new instruction of the Gospel message belongs not to those who are not yet moulded by the Spirit into newness of life and knowledge, and they cannot as yet contain the mysteries of the Holy Trinity. The exposition then of the deeper mysteries of the faith is suitably reserved for the spiritual renovation that was to proceed from the Spirit when the mind of those who believed on Christ would no longer allow them to remain in the obsolete letter of the Law but rather induce their conversion to new doctrines and implant in them thoughts enabling them to see a fair vision of the truth. And that before the Resurrection of our Saviour Christ from the dead, and before partaking of His Spirit, the disciples were living too much after the manner of the Jews, and were clinging to the legal dispensation, even though the mystery of Christ was clearly superior to it, one might very readily perceive. And therefore the blessed Peter, even though he was pre-eminent among the holy disciples, when the Saviour was once setting forth His suffering on the Cross and telling them that He must be outraged by the insults of the Jews, rebuked Him, saying, Be it far from Thee, Lord; this shall never be unto Thee. And yet the holy prophets had plainly |450 declared not only that He would suffer, but also the nature and extent of what He would endure. And let us also examine this further consideration. For when, as is recorded and as we read in the Acts of the Apostles, Peter was hungry and desired to eat, and when he saw thereupon the sheet let down by four corners from heaven, in which were included all creatures of the earth and the sea and the air, and heard a voice from heaven, saying, Rise, Peter, kill and eat; he answered, Not so, Lord; for I have never eaten anything that is common or unclean; and for this received a well-merited rebuke in the answer: What God hath cleansed, make not thou common. And yet he ought to have remembered the frequent statement of our Saviour to the Jews: Not that which entereth into the mouth defileth the man. See then what need there was in his case for the illumination of the Spirit. Do you perceive then that it was necessary that his temper of mind should be forged anew into another better and wiser than that which was in the Jews? And therefore when, by being enriched with the grace that is from above and from heaven, they had their strength renewed, according to the Scripture, and had attained to a better knowledge than before, then we hear them boldly saying: But we have the mind of Christ. By the Mind of Christ they mean nothing else but the advent of the Holy Spirit into their hearts, revealing unto them in due measure all things whatsoever they ought to know and learn. When then “He,” that is the Comforter, the Spirit of Truth, is come, He shall guide you into all the truth. See how free from extravagance the expression is: note the soberness of the phrase. For having told them that the Comforter would come unto them, He called Him the Spirit of Truth, that is, His own Spirit. For He is the Truth. For that His disciples might know that He does not promise them the visitation of a foreign and strange power, but rather that He will vouchsafe unto them His Presence in another form, He calls the |451 Comforter the Spirit of Truth, that is, His own Spirit. For the Holy Spirit is not in truth alien from the Substance of the Only-begotten, but proceeds naturally from it, having no separate existence from Him so far as identity of nature is concerned, even though He may be in some sort conceived of as having a separate existence. The Spirit of Truth then, He says, will lead you to complete knowledge of the truth. For as having perfect knowledge of the truth, of which He is also the Spirit, He will make no partial revelation of it to those who worship Him, but will rather engraft in their hearts the mystery concerning it in its entirety. For even if now we know in part, as Paul says, still, though our knowledge be limited, the fair vision of the truth has gleamed upon us entire and undefiled. As then no man knoweth the things of a man, according to the Scripture, save the spirit of the man which is in him, in the same way, I think, to use the words of Paul, none knoweth the things of God save the Spirit of God which is in Him. When then He cometh, He says, He shall not speak from Himself (He does not say, He will make you wise, and will reveal to you the mystery of the truth); He will tell you nothing that is not in accord with My teaching, nor will He expound to you any strange doctrine, for He will not introduce laws peculiar to Himself; but since He is My Spirit, and as it were My Mind, He will surely speak to you of the things concerning Me. And this the Saviour saith, not that we should suppose that the Holy Spirit has merely ministerial functions, as some ignorantly maintain, but rather from a wish to satisfy the disciples that His Spirit, not being separate from Him so far as identity of Substance is concerned, will surely speak the things concerning Him, and will work and purpose the same. 14 He shall glorify Me: for He shall take of Mine, and shall declare it unto you. As the Holy Spirit was about to reveal to those who should be found worthy the mystery that is in Christ, and to demonstrate completely Who He is by nature, and how great is His power and might, and that He reigneth over all with the Father, Christ is impelled to say, He shall glorify Me. For He sets our mind above the conceits of the Jews, and does not suffer us to entertain so limited and dwarfed a conception as to think that He is a mere Man, slightly surpassing the prophets in the stature they attained, or even falling short of their renown—-for we find that the leaders of the Jews had this idea concerning Him, because they not knowing the mystery of piety, frequently uttered blasphemies against Christ, and, encountering His sayings with their mad folly, said on one occasion: Who art Thou? Abraham is dead, and the prophets are dead; and Thou sayest, If a man keep My word, He shall never see death. Whom makest Thou Thyself? And on another occasion they cast in His teeth the meanness of His birth according to the flesh, and His great insignificance in this respect: Is not this the son of Joseph, whose father |455 and mother we know? How then doth He say, I am come down out of heaven? Note herein the miserable reasoning of the Jews. As then the multitude were so disposed and thought that the Lord was not truly God because in this human frame He was liable to death, and because they did not scruple to entertain the basest conception of His Nature, the Spirit, when He came down from heaven, illustrated completely His glory to the Saints; not that we should say, that He merely convinced them by wise words, but that He by actual proof also satisfied the minds of all that He was truly God, and the fruit of the Substance of God the Father. What then is this proof? And how did He increase the honour and admiration in which Christ was held? By exercising His activity universally in a marvellous and Divine manner, and by implanting in the Saints complete and perfect knowledge, He furthered His glory. For to the Sovereign Nature of the Universe alone must we ascribe omniscience and the sight of all things naked and laid open to the view, and the ability to accomplish all His purposes. 15 All things whatsoever the Father hath are Mine: and therefore I said unto you, that He taketh of Mine and shall declare it unto you. The Son once more shows to us herein the complete and perfect character of the Person of the Father Himself also, and allows us to see why He said that He, being the fruit of the Father’s Substance, engrosses in Himself all that belongs to It, and says that It is all His own, and with reason. For, as there is nothing to dissever or estrange the Son from the Father, so far as their complete similarity and equality is concerned, save only that He is not Himself the Father, and as the Divine Substance does not show Itself differently in the Two Persons, surely Their attributes are common, or rather identical; so that what the Father hath is the Son’s, and what He That begat hath, belongs also to Him that is begotten of Him. For this reason, I think, in His watchful care over us, He has thus spoken to us concerning this. For He did not say, All things whatsoever the Father hath I have also, in order to prevent our imagining He meant a mere likeness founded on similarity, only moulded by adventitious graces into conformity with the Archetype, as is the case with us; for we are after God’s likeness. Rather, when He says, All things whatsoever the Father hath are Mine, He illustrates hereby the perfect union which He hath with His Father, and the meaning of |458 their Consubstantiality existing in unchangeable attributes. And this you may see, that He clearly says elsewhere, when addressing the Father, All things that are Mine are Thine, and Thine are Mine. For surely they are identical in nature, in whom there is no severance at all, but complete and perfect essential equality and likeness. God the Father then hath, of Himself, and in Himself, His own Spirit; that is, the Holy Spirit, through Whom He dwelleth in the Saints, and reveals His mysteries to them; not as though the Spirit were called to perform a merely ministerial function (do not think this), but rather, as He is in Him essentially, and proceeds from Him inseparably and indivisibly, interpreting what is in reality His own when He interprets that which belongs to Him in Whom He exists, and from Whom He springs. For God only has union with the creation through His Son in the Spirit. And this Spirit is also an attribute of the Only-begotten, for He is Consubstantial with the Father. Since then, He says, it is seen to be natural to God the Father to reveal Himself in His own Spirit to those who are worthy of Him, and to accomplish through Him all His purposes, and since this kind of action belongs to Me also, for this cause I said, “He receiveth of Me and will show it unto you.” And let no man be perplexed when he here hears the word “receiveth,” but rather let him consider the following fact, and he will do well. The things of God are spoken of in language as though God were even as we are; but this is not really the case, for His ways are superhuman. We say then that the Spirit receives of the Father and the Son the things that are Theirs in the following way; not as though at one moment He were devoid of the knowledge and power inherent in Them, and at the next hardly acquires such knowledge and power when He is conceived of as receiving from Them. For the Spirit is wise and powerful, nay, rather, absolute Wisdom and |459 Power, not by participation in anything else, but by His own Nature. But, rather, just as we should say that the fragrance of sweet-smelling herbs which assails our nostrils is distinct from the herbs so far as their conception in thought is concerned, but proceeds from the herbs in which it originates only by being a recipient of their faculty of giving scent in order to its display, and is not in fact distinct from them, because its existence is due to, and is wrapped up in, them; even such an idea, or rather one transcending this, must you imagine about the relation of God to the Holy Spirit. For He is, as it were, a sweet savour of His Substance, working plainly on the senses, conveying to the creature an effluence from God, and instilling in him through Itself participation in the Sovereign Substance of the Universe. For if the fragrance of sweet herbs imparts some of its power to garments with which it comes in contact, and in some sort transforms its surroundings into likeness with itself, surely the Holy Ghost has power, since He [is by nature of God, to make those in whom He abides partakers in the Divine Nature through Himself. The Son then, being the Fruit and express Image of the Father’s Person by nature, engrosses all that is His. And therefore He says, All things whatsoever the Father hath are Mine: therefore said I unto you, that He taketh of Mine and shall declare it unto you—-the Spirit, that is, Who is through Him and in Him, by Whom He personally dwells in the Saints. For His Spirit is not distinct from Him, even though He may be conceived of as having a separate and independent existence: for the Spirit is Spirit, and not the Son. Today’s Mass Readings in the NABRE. Used in the USA. Today’s Mass Readings in the New Jerusalem Bible. Used in most English speaking countries. COMMENTARIES ON THE FIRST READING: Acts 8:5-8, 14-17. Father Callan’s Commentary on Acts 8:5-8, 14-17. Pending: Father MacEvilly’s Commentary on Acts 8:5-8, 14-17. Word-Sunday Notes on Acts 8:5-8, 14-17. Homilist’s Catechism on Acts 8:5-8, 14-17. Navarre Bible Commentary on Acts 8:5-8, 14-17. COMMENTARIES ON THE RESPONSORIAL: Psalm 66. Father Boylan’s Introduction to Psalm 66. St Augustine’s Notes on Psalm 66 . A Patristic/Medieval Commentary on Psalm 66. Word-Sunday Notes on Psalm 66. COMMENTARIES ON THE SECOND READING: 1 Peter 3:15-18. Father MacEvilly’s Commentary on 1 Peter 3:15-18. Word-Sunday Notes on 1 Peter 3:15-18. Homilist’s Catechism on 1 Peter 3:15-18. Navarre Bible Commentary on 1 Peter 3:15-18. COMMENTARIES ON THE GOSPEL READING: John 14:15-21. Aquinas’ Catena Aurea on John 14:15-21. Cornelius a Lapide’s Commentary on John 14:15-21. Fathers Nolan’s and Brown’s Commentary on John 14:15-21. St John Chrysostom’s Homiletic Commentary on John 14:15-21. St Augustine’s Tractate on John 14:15-21. St Cyril of Alexandria’s Homiletic Commentary on John 14:15-21. Word-Sunday Notes on John 14:15-21. Homilist’s Catechism on John 14:15-21. Navarre Bible Commentary on John 14:15-21. A First Communion Sermon. Sancrucensis Blog. The Sending of the Spirit: “Another Advocate.” Sacred Page Blog. Catholic biblical scholar Dr. Michael Barber’s commentary and reflections on the readings. Doctrinal Homily Outline. Theme of the readings; doctrinal message; pastoral application. Lector Notes. Historical and theological background, usually on the 1st and 2nd readings.